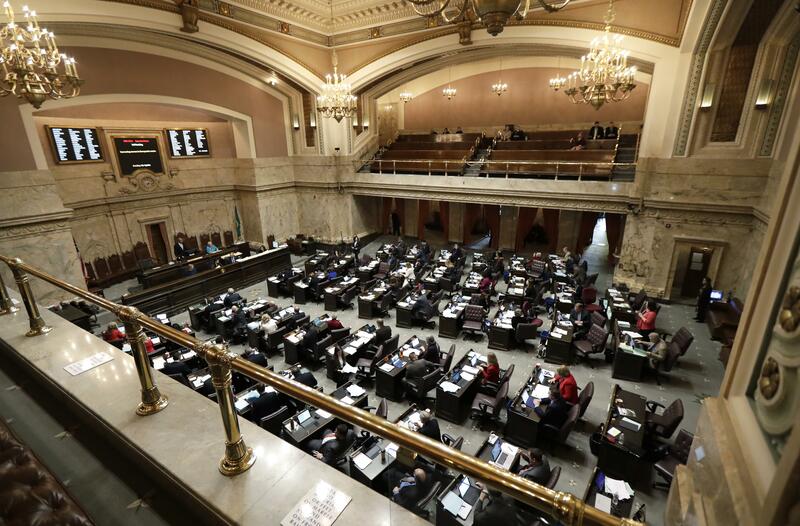 As the Legislature works to find ways to make higher education more accessible to more people, lawmakers continue to differ on how much to spend on Washington’s largest scholarship program, or even what to call it. That program is the State Need Grant, eligible to those at or below 70 percent of the state’s median family income, which is $61,500 for a family of four. But a quarter of eligible students, about 22,600, did not receive a scholarship in 2018 because money ran out. The House is considering a broad bill on many forms of college aid with a significant expansion of the Need Grant program. It would increase the taxes on businesses most likely to benefit from workers with college degrees. The bill was influenced by an op-ed from leaders at Microsoft, the University of Washington and the State Board for Community and Technical Colleges. They called for expanding higher education opportunities by asking large companies “to do a bit more” by paying a higher business and occupation tax. “Let’s use this opportunity to create in our state at least a partial antidote to the current lack of access to new skills and higher education that’s bothering the nation. Let’s build a ‘recession proof’ workforce education fund that’s open on fair terms to everyone,” they wrote. The House proposal would rename the State Need Grant the Washington College Grant and guarantee full tuition and fees for all those currently eligible under the program. Those between 71 and 100 percent of the median family income would be eligible for a prorated award. Allow cities, counties and tribes to contribute to the Washington State Opportunity Scholarship program, which would allow students from their area to receive that money and a matching amount from the state. To pay for these and other higher education programs, the bill would raise the B&O tax on a sliding scale for industries that rely heavily on college graduates. The House’s biennial budget proposal includes $389.6 million for higher education with $218.6 million going for the Washington College Grant. Other plans for the State Need Grant are less sweeping. Gov. Jay Inslee’s proposal would guarantee a scholarship to all students eligible under the existing requirements and would increase the maximum award to cover full tuition for those under 50 percent of the state’s median income. It would add $103.3 million to the program and be renamed the Washington College Promise Scholarship. The Senate’s budget proposal would add $80.5 million to the program and also change the name to the Washington College Promise Scholarship. But it would only promise a full scholarship to those at 110 percent of the federal poverty level, or a family of four making about $28,000. Those students would get a maximum award of full tuition, and other students below 70 percent of the median family income would receive a prorated award until the money runs out. One program that depends on lawmakers agreeing to eligibility requirements for the State Need Grant is the College Bound Scholarship. The program allows middle school students who are eligible for free and reduced-price lunch to sign a pledge to graduate and receive full tuition if their family has an income below 65 percent of the median family income when they graduate. One proposal would allow students in ninth and 10th grade, who were previously not eligible, to sign up. Allowing more students to see themselves in a post-secondary opportunity would help close opportunity gaps for students across the state, said Katherine Mahoney, of the Office of Superintendent of Public Instruction. Low-income students graduate from high school at lower rates, attend college at lower rates and get their diplomas at lower rates than students from other income levels, she said. In 2018, about 3,000 students would have been eligible for the expanded program, she said. Instead of the current first-come, first-serve system, the bill would prioritize giving grants to graduates who come from families with between 65 percent and 70 percent of the median income. This could potentially delay financial aid awards because of uncertainty over which students would get priority, said Cody Eccles, of the Council of Presidents. But Sen. Guy Palumbo, D-Maltby, said that problem would go away with full funding for the State Need Grant. Another bill would require institutions with on-campus housing to provide a waiver to first-year College Bound students who are homeless when they enroll. Those eligible for free and reduced-price lunch would also be eligible for the Washington Dual Enrollment Scholarship Pilot program, which would cover tuition for Running Start and College-In-High-School programs. The program would also provide textbook vouchers. The bill would also require school districts to provide documentation of a student’s low-income status to the institutions. “Sometimes, students are a little tired of raising their hand and saying, ‘I’m low-income, can you help me,’ ” she said. Students between ages 16 and 21 could receive a high school diploma from community and technical colleges if they complete their associate degree under a different bill. The certificate is often necessary for jobs and requesting financial aid. One bill would require institutions offering concurrent enrollment programs to be nationally accredited within 10 years. Another would create a systemwide credit policy regarding advanced placement, international baccalaureate and Cambridge international exams. These would allow high school students to receive accredited college level courses with transferable credits, which could help some students save money. Another bill would require school districts to provide access to at least one career and technical education course. These courses would be considered a statewide equivalency credit, rather than an elective, and would be transferable. For instance, a carpentry class would meet the state standard for geometry. One bill would create a competitive grant program for students attending community and technical colleges who experience unforeseen emergencies. This money could go toward rent, utilities and other services necessary for students to remain enrolled. Institutions would apply for money and disperse it as necessary. The bill would also attempt to increase student access to the federal Supplemental Nutrition Assistance Program. Another bill would create a pilot program that would require certain higher education institutions to provide basic accommodations to students, including access to short-term housing, reduced-price meal plans and laundry facilities. A loan program for National Guard members, which currently forgives repayment upon graduation, would be changed to a grant without conditional repayment under one bill. Out-of-state veterans would be eligible for in-state tuition under a different bill. The tuition waiver for survivors of veterans and National Guard members who were killed, totally disabled or a prisoner of war would increase from 200 to 250 credits under another bill. Eligibility would be expanded to include those whose sole reason for discharge was due to gender or sexuality. One bill would expand tuition waivers for children of contracted highway workers killed or disabled at work.